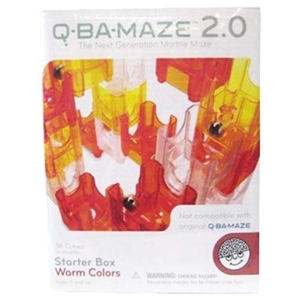 Q-BA-MAZE 2.0 is not an ordinary marble run. The unique cube design and sliding side connections allow your marble maze to take on surprising shapes - from a twisting tower to a graceful butterfly. Plus, the precision engineering of the double exit cubes leaves everyone wondering, "Which way will the marbles go?" The pieces in this set are red, yellow, and clear. Ages 5 and up. Not compatible with the original Q-BA Maze.